The last remaining HFO-fired power plant at the Delimara Power Station and its 150-metre chimney started being dismantled this morning. 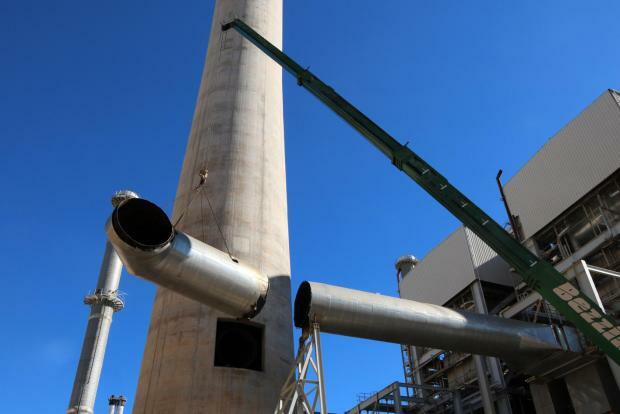 A few days ago, the Enemalta’s demolition contractors cut and removed two large exhaust pipes connecting the plant’s heavy fuel oil (HFO) boilers to the chimney. Other workers started dismantling the first of the two boilers. The year-long project includes the complete demolition of the concrete and steel chimney, weighing almost 9,000 tonnes or the equivalent of 6,000 cars, as well as the plant’s boilers, turbines and other auxiliary installations. The 1992 120 MW Delimara 1 power station was switched off and put on cold standby in April, before it was fully decommissioned on September 1. A few days later, the Italian demolition contractors selected for this project started delivering the heavy machinery and other equipment required to dismantle the plant. The plant’s chimney structure comprises a cylindrical concrete shield rising 50 storeys, with a base diameter of 12 metres. The concrete walls are 80 centimetres thick at the bottom and 30 centimetres on top. Inside the concrete structure there are two 2.3 metre steel exhaust pipes that emitted the smoke produced by the oil-fired boilers. 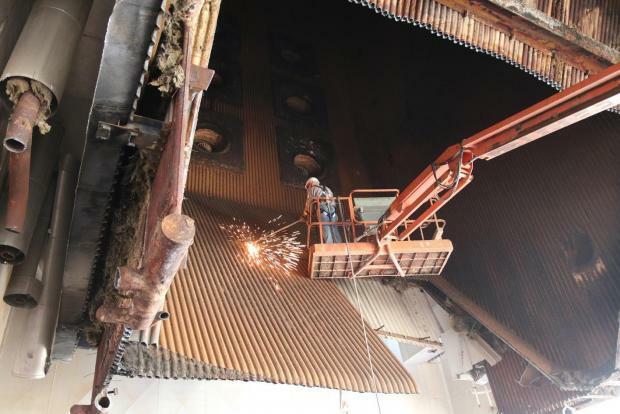 The dismantling process started with the removal of the lowermost part of these two steel pipes, which connect the chimney to the boilers. The remaining metal pipes, ladders and platforms will be lowered to ground level using strand jacks, so that they can be safely dismantled on the ground. The contractors will soon start erecting an auto-lifting platform on five steel columns rising to the topmost part of the structure outside the chimney’s concrete walls. Once all the metal inside the structure is removed, remote-controlled demolition robots on top of the platform will start pulling down the top 1.5 metres of the concrete walls. The platform will then be lowered 1.5 metres for the demolition robots to continue the demolition. All debris will reach the base of the chimney through the chimney itself, to minimise dust dispersion. It will then be loaded on trucks at ground level. This process will be repeated about 80 times until the chimney is reduced to 35 metres. At this point, the platform will be dismantled and the remaining part of the stack will be demolished using a high reach demolition excavator from ground level.